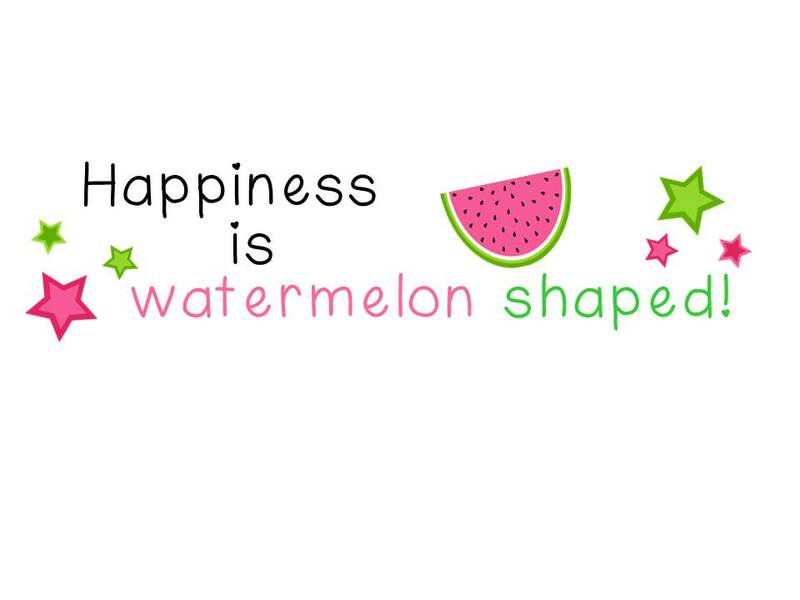 Book Review - Ten Little Turkeys - by Angela Muse - HAPPINESS IS WATERMELON SHAPED! 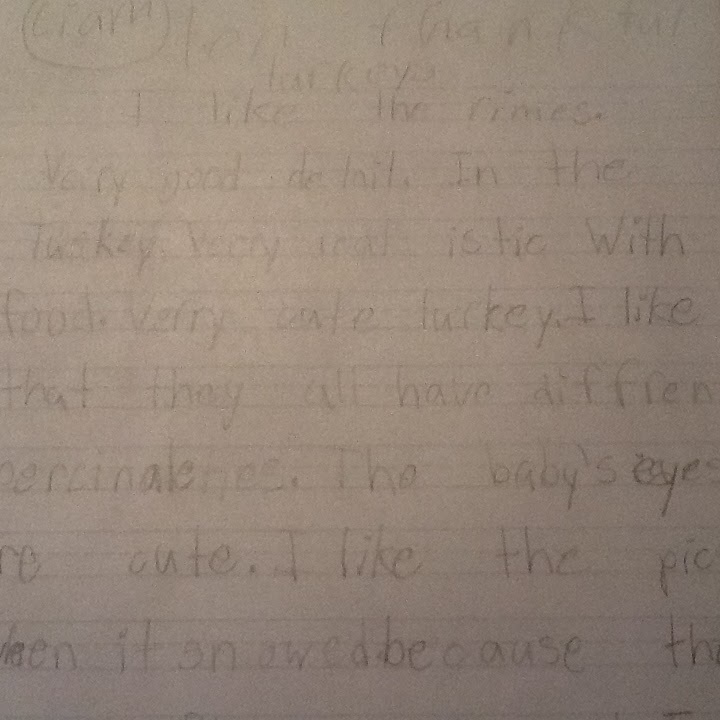 Liam wrote: I like the rhymes....very realistic with food...very cute turkeys. I like that they all have different personalities...I like the picture when it snowed because the snowflakes were cool. I like the turkey facts. You should write more books because they are cool. Georgia wrote: ..I like that they are making a feast...They all have different personalities. I like the baby turkey. 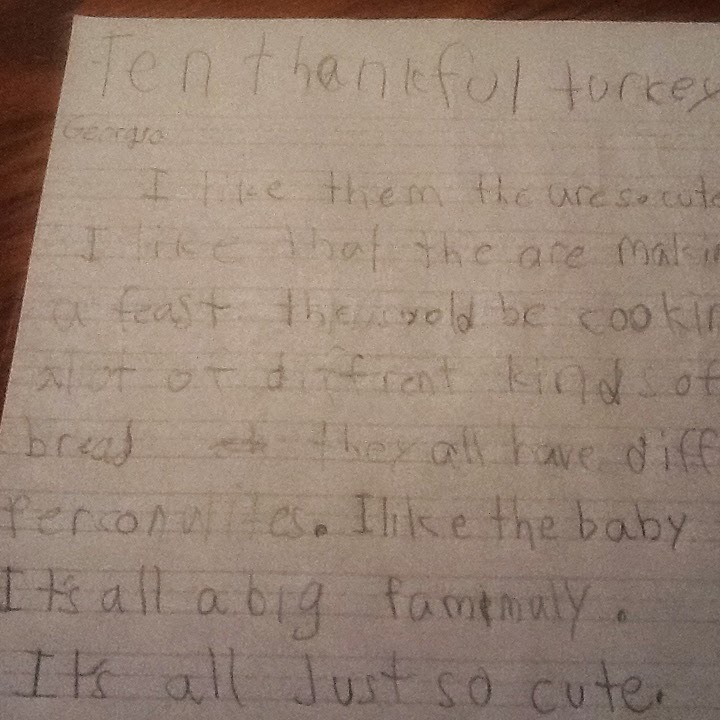 It's all a big family...They are wearing Pilgrim hats..
Mia felt: ...I like that you wrote turkey facts. I feel bad for turkeys because people eat them. I love your books. I want to read all of them! Here's an excerpt from Danielle: I like the leaf behind the writing...the interesting words...I love the picture with everybody sitting together as a family because I love my family. Matthew's thoughts include: ...feel bad for the 7th turkey/WRONG TAIL! Overall, the kids and I LOVED the book, especially the rhyming and the illustrations. The kids were able to make connections to the turkeys. The author/illustrator will able to make each turkey unique in its personality, and the kids really noticed that. 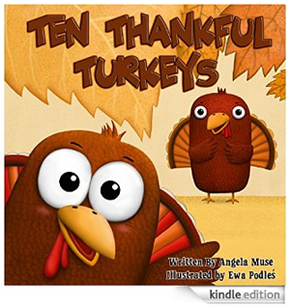 Plus, now we want to read all of Angela Muse's books because we enjoyed Ten Thankful Turkeys so much! Here's the link to Ten Thankful Turkeys on Amazon. This is definitely a book that you'll enjoy for years to come! Five For The Last Friday In October! Positive Thinking Thursday on a Fabulous Friday! 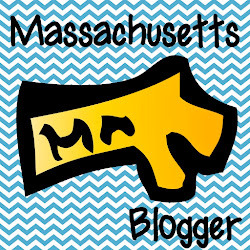 Wordless Wednesday & What I Wore! Fall For Five For Friday! What I Wore + Wordless Wednesday Link-Ups! Book Review For Lobo Goes To The Galapagos!